House Greyjoy has ruled over the Iron Islands for 300 years. Known for their ruthless nature, as cold and inhospitable as the lands they inhabit, the ironborn have a distinct culture that stands separate from the gentler traditions of Westeros. These men and women worship the Drowned God and rely on raiding coastal villages for much of their resources. Even their House words, �We Do Not Sow� speaks to the proud and bloodthirsty nature that all must have in order to survive on the craggy islands. Kings of the Isles is a deluxe expansion for A Game of Thrones: The Card Game that brings House Greyjoy, too oft ignored by the courtiers of King�s Landing, to the centerstage. With 156 cards, you will find every tool you need to take on the Houses of the mainland, including new cards centered on the Raider and Drowned God trait and new versions of the most vicious Greyjoy characters like Asha Greyjoy, Balon Greyjoy, and Euron Crow�s Eye. But the Greyjoys are not the only ones who have learned to embrace the cutthroat practices of war. 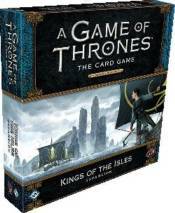 Every House in A Game of Thrones: The Card Game is represented in this deluxe expansion, gaining new House cards and a variety of neutral cards that any player can turn to their advantage.